Looking for more from your work life? Want to jump back into work after a break, into something new? Longing for community, or refreshingly real conversations about work? If so, this event is for you. 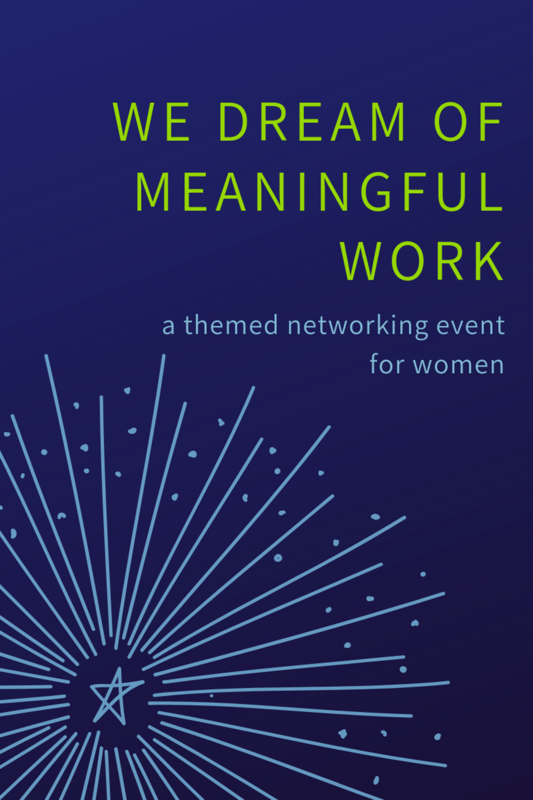 Come to We Dream of Meaningful Work, and intimate gathering of women who care. Space will be limited to 15; the evening will be facilitated to set the tone and guide participants toward knowing one another personally. The event will culminate in sharing recent successes & challenges, and offering mutual support. >>> Meet other professional women seeking authentic community. >>> Connect personally- and in meaningful ways- through a guided series of fun exercises. >>> Relax, share helpful insights and enjoy mutual support in a safe environment. >>> Leave feeling uplifted and rejuvenated. 1/10/19 6-8:30pm: Downtown HUB Co-working Space, Framingham, MA. Click here to register. 1/17/19 6-8:30pm: The Village Works, Brookline, MA. Click here to register. 1/24/19 1-3:30pm : Crystal Portal Gallery, Arlington, MA. Click here to register. 1/24/19 6-8:30pm: Crystal Portal Gallery, Arlington, MA. Click here to register. "Julie created a safe, open environment in which virtual strangers felt comfortable sharing personal thoughts and feelings, and could connect with one another in a profound and meaningful way. It was absolutely remarkable how different the room felt at the end in comparison to when we walked in. Julie created this magic." "I have been a part of a few groups facilitated by Julie. When Julie brings her experience as a Life Coach to the group setting magic happens! People start to open up and share. What I love about the groups Julie leads is they are simultaneously structured and free-flowing. Julie always has a facilitation plan but is great about recognizing the group energy and letting the experience naturally evolve. As a participant, I greatly value this. It makes the group experience more productive and organic. I always leave Julie's groups feeling more connected to others, uplifted and rejuvenated." 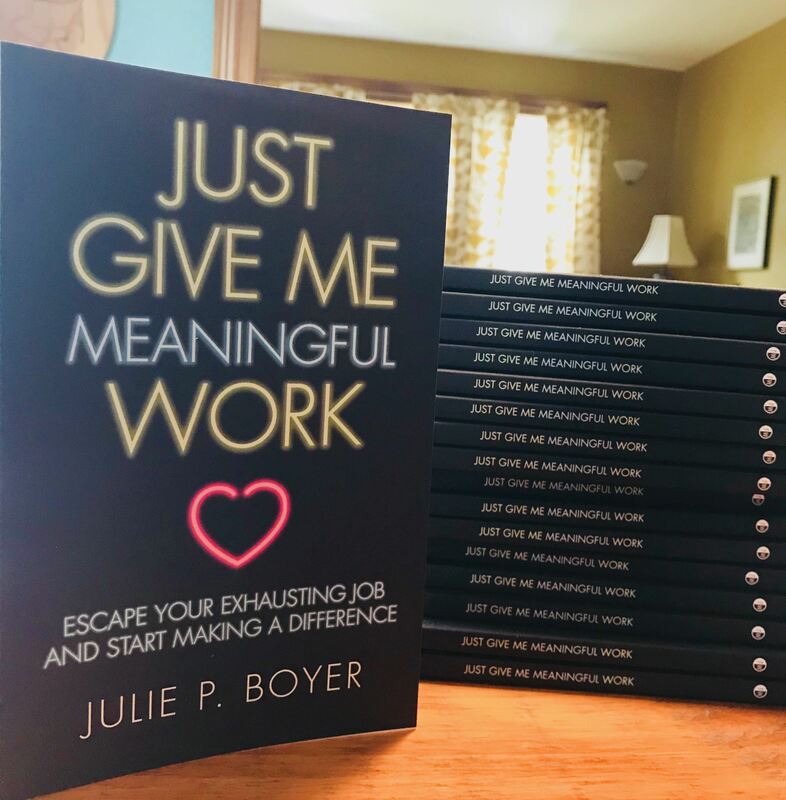 Just Give Me Meaningful Work; Escape Your Exhausting Job and Start Making a Difference launched in bookstores December 4, 2018! Nominate your favorite bookstore for a book-signing event by emailing julie@julieboyercoaching.com. Do you just want a job you love, without the emotional drain? If you want more from your career, but you're stuck because you don't know where to start, this class is for you. 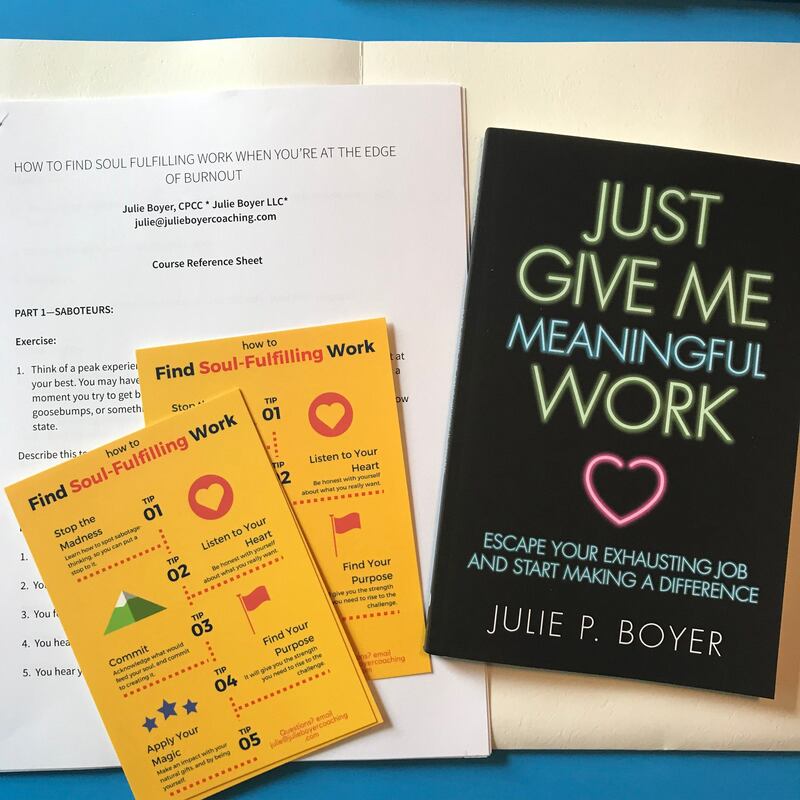 Julie Boyer CPCC, coach and author of the book Just Give Me Meaningful Work, will show you three keys to finding work that sustains your soul. In this interactive class, you'll discover what's keeping you from a happy career (so you can see what's actually possible), how to quickly access the clarity you need to take action, and how to stay strong and confident as you break new ground. Each participant will leave with exercises to complete as well as a free copy of the instructor's book, to serve as a guide moving forward.